Sometimes the simplest idea makes the best present. 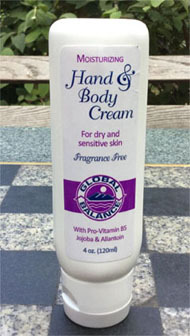 Global Balance Hand & Body Cream is a 100% fragrance-free moisturizer for dry, chapped and sensitive skin. What makes this a great gift? It keeps skin soft and smooth and is particularly effective in the cold of winter. It’s 4 oz. - small enough to carry in a pocketbook; throw in a gym bag; keep in a desk drawer. For this item, the cost of shipping throughout the USA is covered in the price. Here’s all you have to do: Place the order on our website or by phone and we’ll do the rest. We’ll ship the order to the gift recipient with a card letting them know that the gift is from you. Let us know if you want to personalize the message. Let us know when you want the package to arrive. If you include the recipient’s email, we will notify them to expect a gift from you via Sunrise Lane. We will track the shipment from our end and inform you when the package has arrived. May we suggest another gift idea? 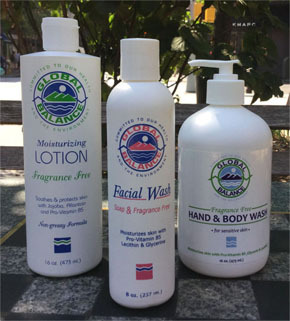 Introduce a friend to the world of unscented, 100% fragrance free, body care by Global Balance.